Description: Larry W. Hurtado has been one of the leading scholars on early Christology for decades. In Honoring the Son: Jesus in Earliest Christian Devotional Practice, Hurtado helps readers understand early Christology by examining not just what early Christians believed or wrote about Jesus, but what their devotional practices tell us about the place of Jesus in early Christian worship. Drawing on his extensive knowledge of early Christian origins and scholarship on New Testament Christology, Hurtado examines the distinctiveness of early Christian worship by comparing it to both Jewish worship patterns and worship practices within the broader Roman-era religious environment. He argues that the inclusion of the risen Jesus alongside the Father in early Christian devotional practices was a distinct and unique religious phenomenon within its ancient context. Additionally, Hurtado demonstrates that this remarkable development was not invented decades after the resurrection of Christ as some scholars once claimed. Instead, the New Testament suggests that Jesus-followers, very quickly after the resurrection of Christ, began to worship the Son alongside the Father. 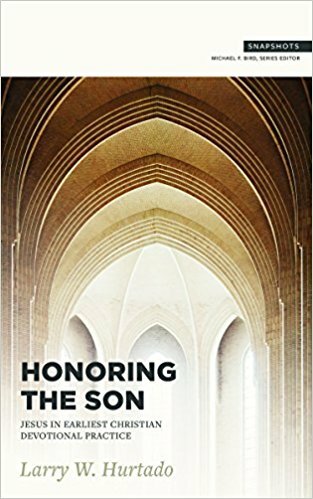 Honoring the Son offers a look into the worship habits of the earliest Christians to understand the place of Jesus in early Christian devotion. Citation: Yung Suk Kim, review of Larry Hurtado, Honoring the Son: Jesus in Earliest Christian Devotional Practice, Review of Biblical Literature [http://www.bookreviews.org] (2019).